Post a direct link to your drabble in the comments (or, if you don’t have a blog, just go ahead and post your drabble in the comments here). In the post on your blog, make sure to link back to the original post. 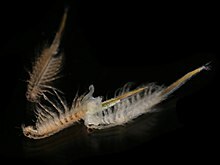 S cientifically, they are known as Artemia salina, though, most people know them either as Brine Shrimp or Sea Monkeys. They have changed very little since the period in which dinosaurs ruled the earth and can be found world wide in saltwater lakes. They are sold as novelty pets, bringing delight with their short lifespan. Their eggs have the ability to remain metabolically inactive for up to two years. This ability is called cryptobioisis, meaning hidden life. For my Betta though, they have only one true meaning, one true name that stands out among the rest.